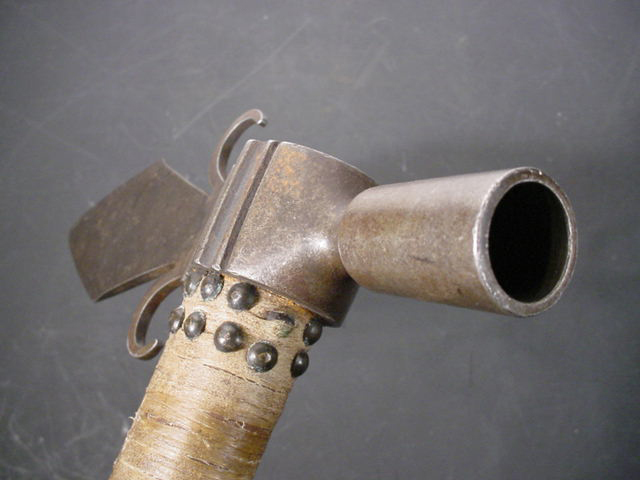 DESCRIPTION: This is a magnificent brass-headed pierced tomahawk of the last style used in the history of the tomahawk. 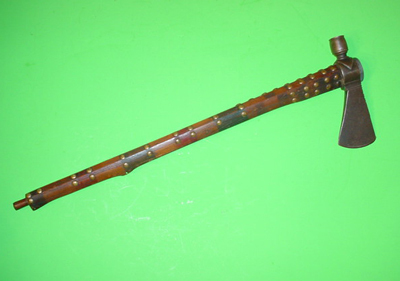 The head and blade are of the distinctive triangular shape with a brass-tack studded haft and elongated pipe bowl. 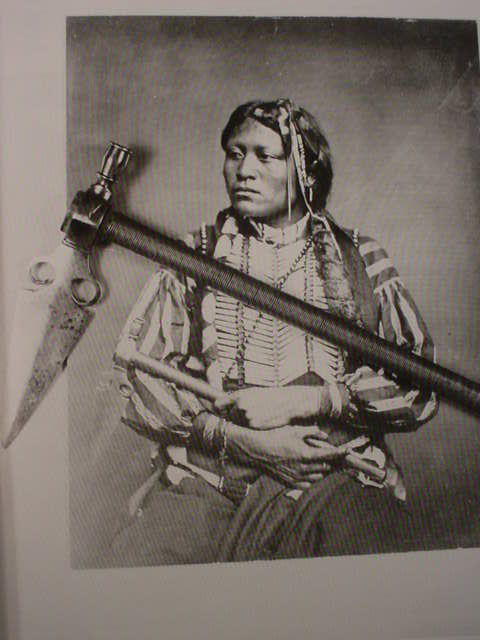 By the time this brass-headed ax was crafted, the Indians of the plains were coming to an end and the tomahawk was something to pose with for pictures taken by frontier photographers like Matthew Brady. 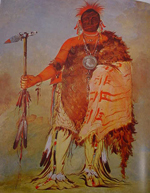 This style is strictly the favored type traded to and carried by Plains Indians such as Sioux, Arapaho, Cheyenne, and Crow. 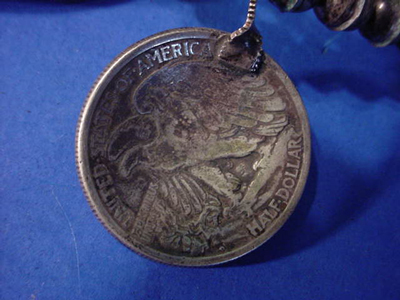 The brass tacks used liberally on this hawks haft show it to be after 1880. This decoration method remained popular. 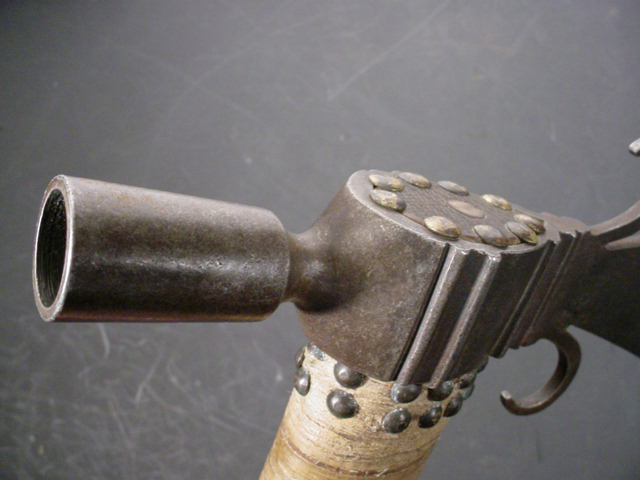 Cast brass tacks are the earliest form; however, all types of tax and brass nails were used as decoration throughout the pipe-tomahawk era. All sorts of pierced blades have also been encountered; the heart cutouts being always most popular, but other shapes were legion. The Christian cross was recognized by the Native Americans as a symbol of much power regardless of whether the warrior remained pagan or embraced the white man's religion. 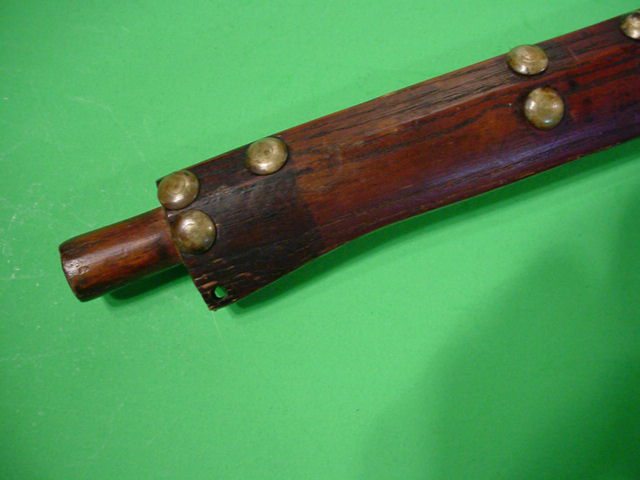 The example we offer here has the typical cross trade pieces brought by French trappers and traders; thus, the cross of Lorraine-style cross. 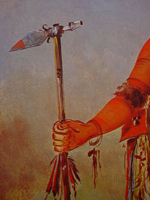 This hawk has a “drop.” This is an attachment used as additional decor on a prized tomahawk. 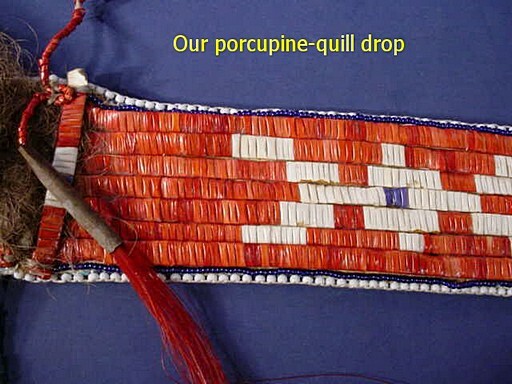 Often they are beaded with elaborate design, but in this case the drop is a section of buffalo tail attached to an 8 inch piece of porcupine-quill work. 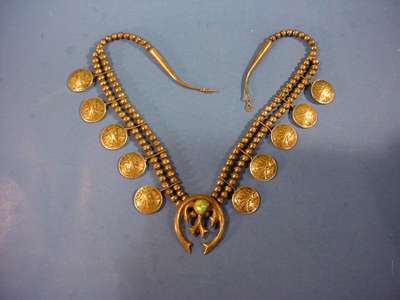 This is rare, and it is 100 percent authentic to the 1880s style craftsmanship of the Central Plains culture groups. The haft is 100 percent original with file burnings. 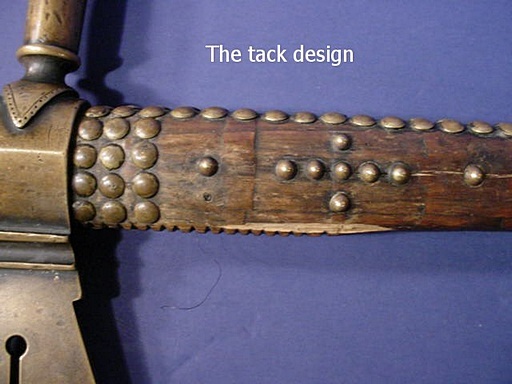 The Indians would take a traded wood file and heat it then make designs on the haft. 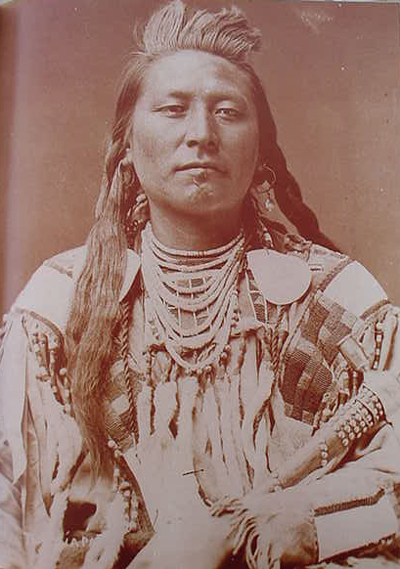 This is typical of the Sioux. 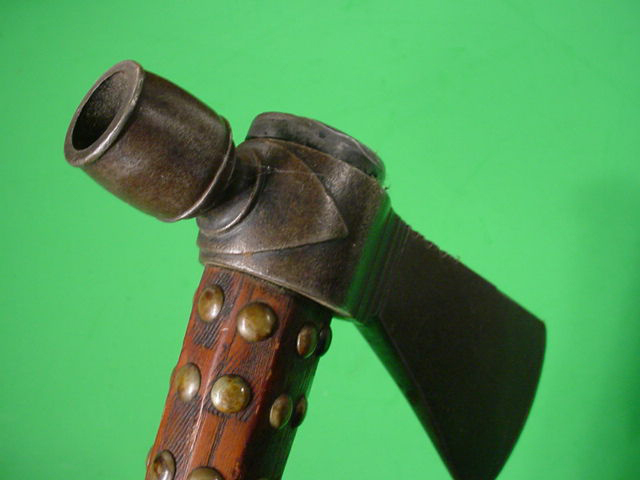 The ax is 23 inches long and the head is 12 1/2 inches from the head of the bowl to the edge of the blade. The blade is 5 inches wide. The drop is backed in Pioneer gingham. This was a cloth favored by and sold or traded to the Indians regularly by Indian trading posts in forts and reservations. 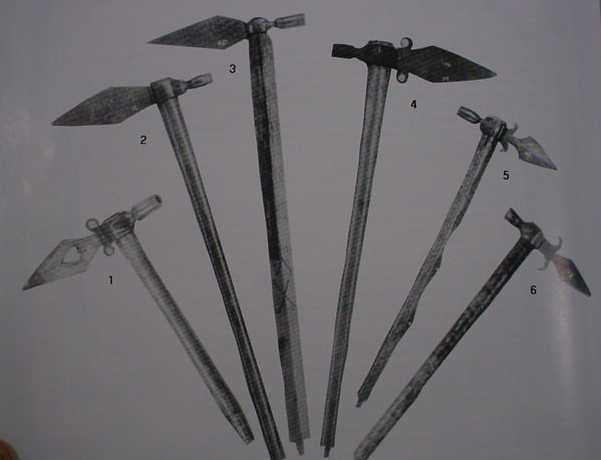 For information and pictures we have used the great book Tomahawks Pipe Axes of the American Frontier by John Baldwin. This hawk is one of the finest we have ever seen and belongs in a museum or and a fine collection of spectacular items of the American West. 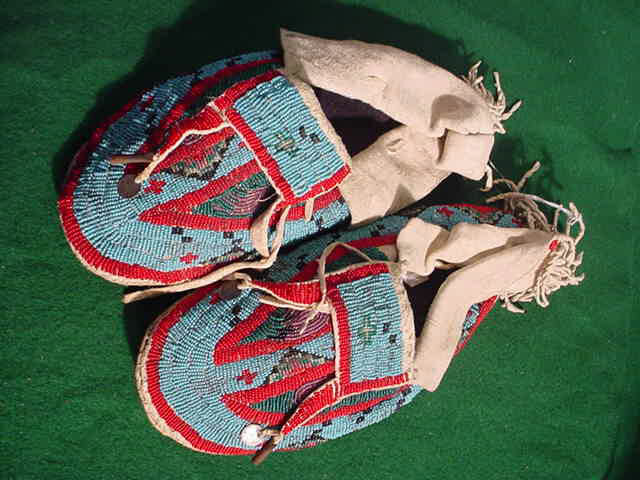 DESCRIPTION: This is a fine pair of genuine Plains Indian Moccasins with tongue flaps. 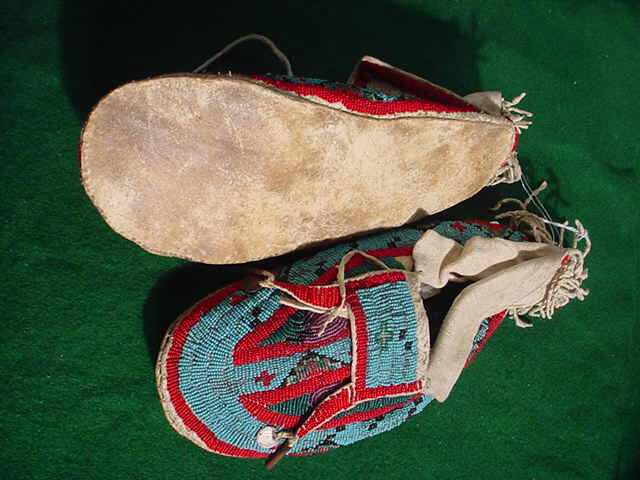 They are hard sole types used by Souix , Crow, and Blackfoot Tribes. They probably date in the 1890’s and are in fine contrition throughout. Beautiful and with typical coloration. They don’t come much better! 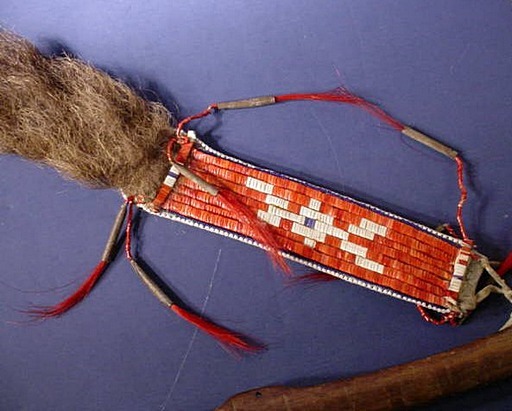 DESCRIPTION: This little beaded bison fetish is of the style of the umbilical cord holder used by Plains Indians to be a repository for the child’s naval cord and hung from the cradleboard. 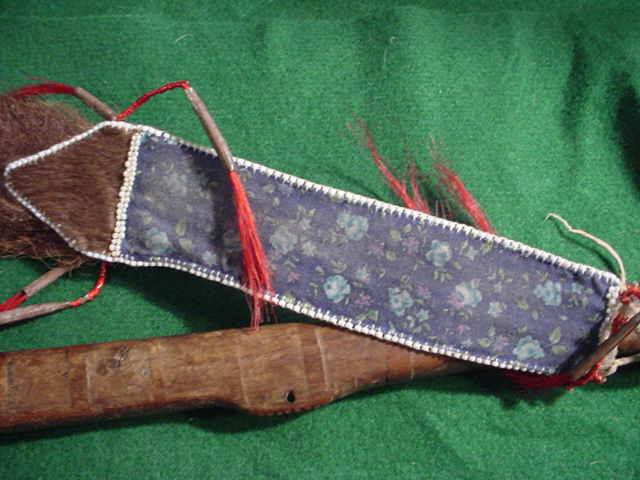 Later, they were worn by the children or attached to their clothing. 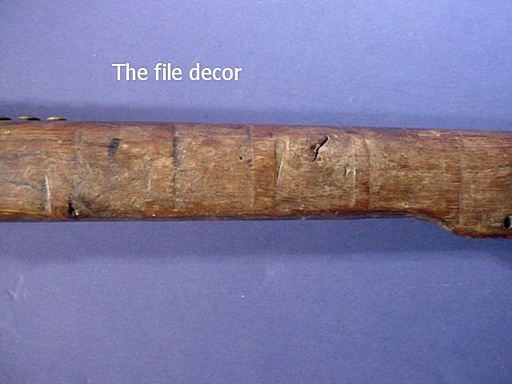 However, when one of these is found it usually has a slit where the umbilical cord is deposited. 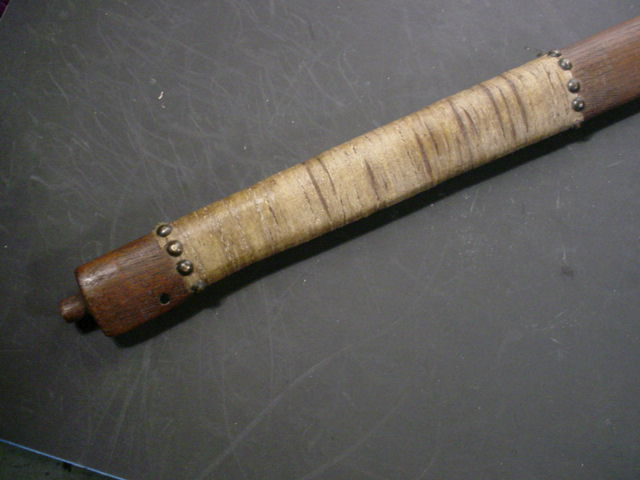 In this case, here is no slit so possibly this was one that was prepared but for some reason not used. The buffalo is shown here in actual size. 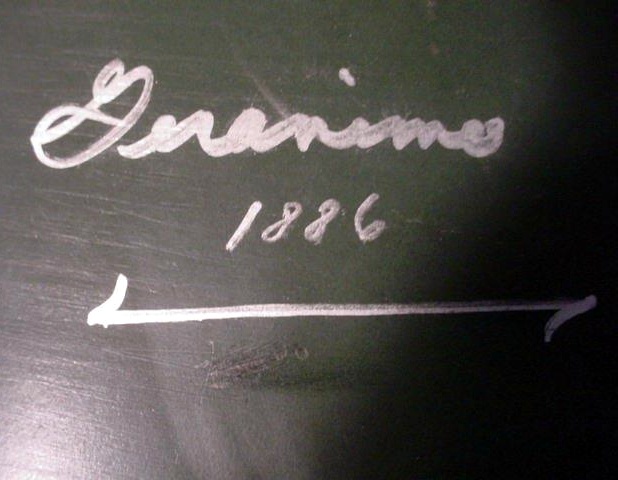 Nice condition; dates probably around the late 1800’s. 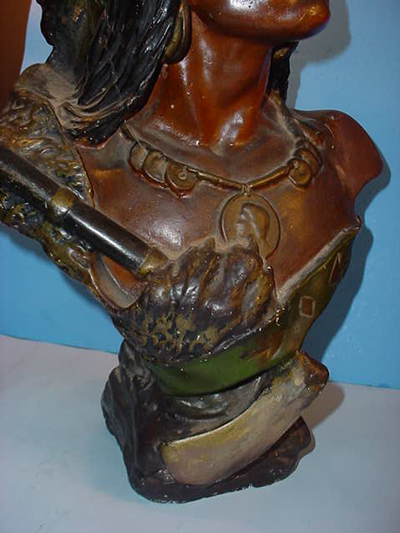 A nice piece of native American art. 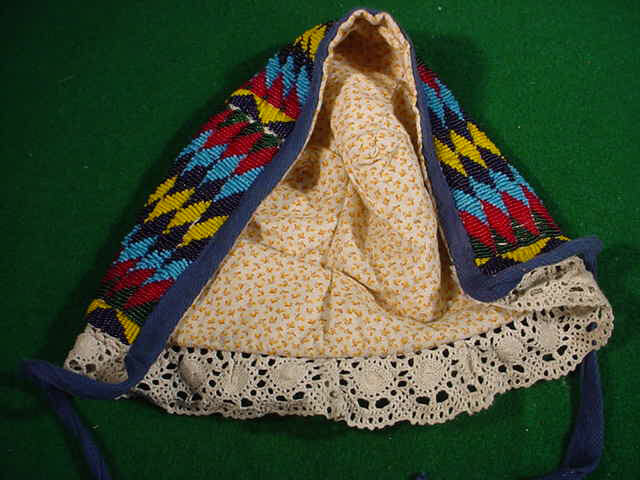 DESCRIPTION: This is a really wonderful bonnet of the type used by ladies of the American Western Plains. 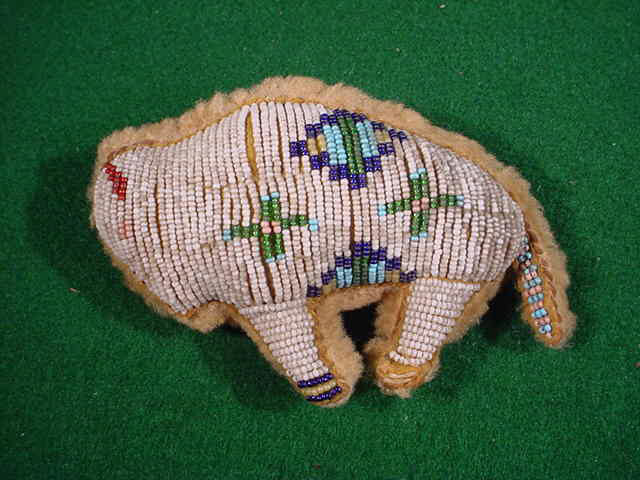 This was beaded by the mother of a Blackfoot boy and was presented to his schoolteacher who he loved and respected. 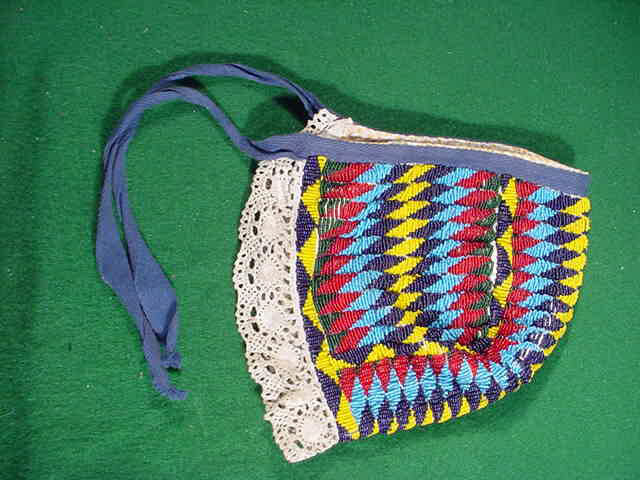 It is patterned in the traditional geometrical design with vibrant coloration. The edges are left in soft cloth embroidery,. The liner is in typical gingham material of the late 1800’s. 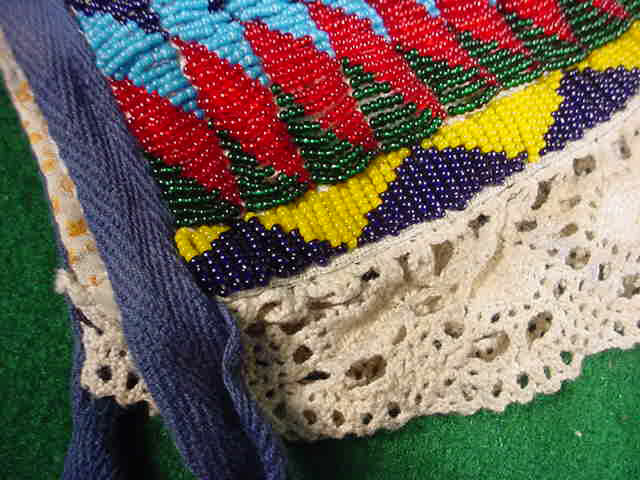 This is a very unusual beaded piece of native Americana. DESCRIPTION:This is a true museum piece. 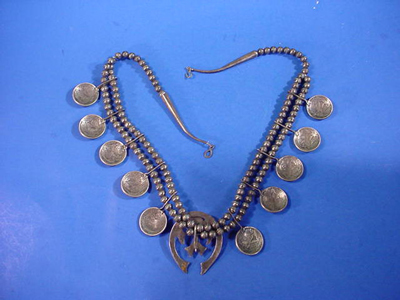 A necklace of the Squash Blossom type where American 50 cent coins were used between the silver beads. 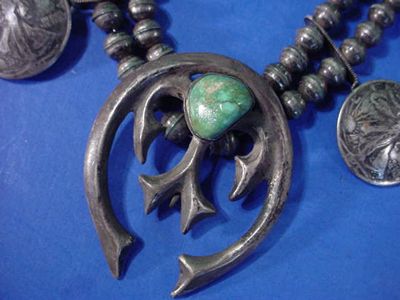 The central piece or “Naja” is of the typical earth mother design with a fine piece of Bisbee turquoise mounted therein. 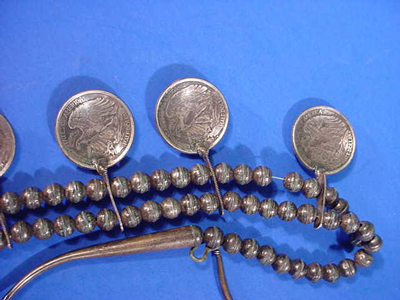 The silver coins date between 1935 to 1945. 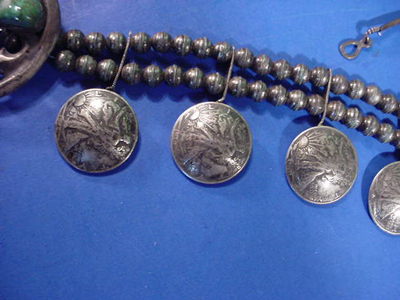 So, it is presumed that this is just about when the necklace was constructed. 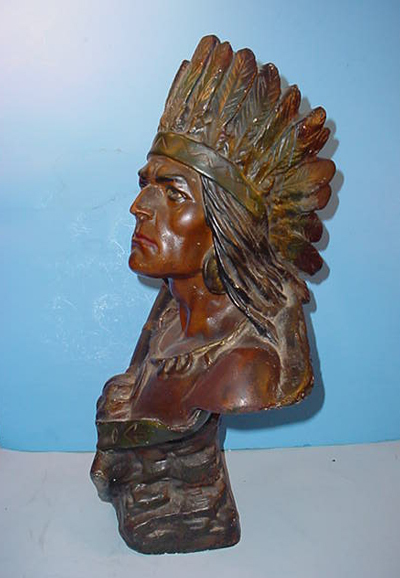 It is not all that old but is still a fine Native American relic and quite beautiful in its own right. 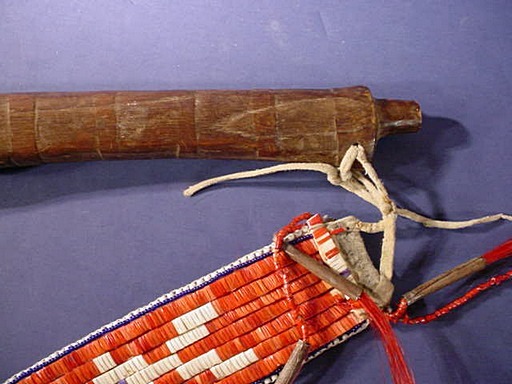 DESCRIPTION: Here is a classic pipe tomahawk of the type that was traded to the Indians of practically all the nations from the east coast to the far western plains. 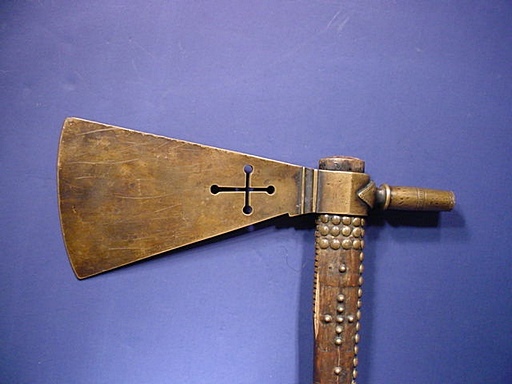 The axe heads were produced in iron shops back east but the haft that was generally decorated with driven brass tacks were generally produced by the tribesmen themselves. 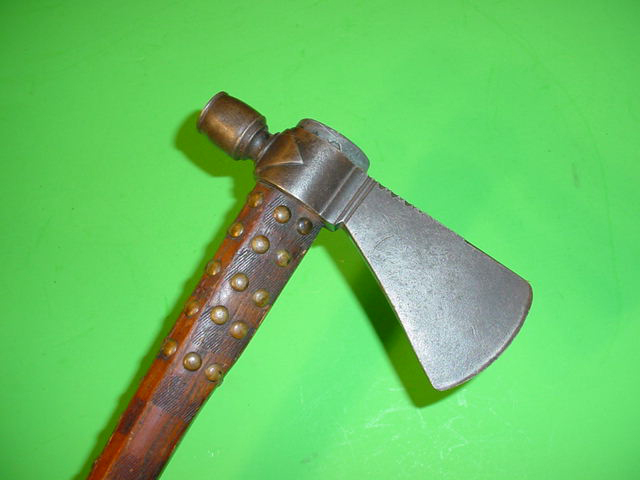 The tomahawk haft with head measures 21 inches. 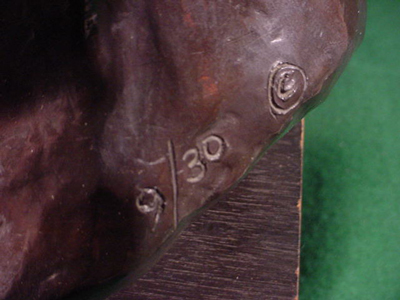 The head measures 6- 3/4ths from cutting edge to pipe bowl. 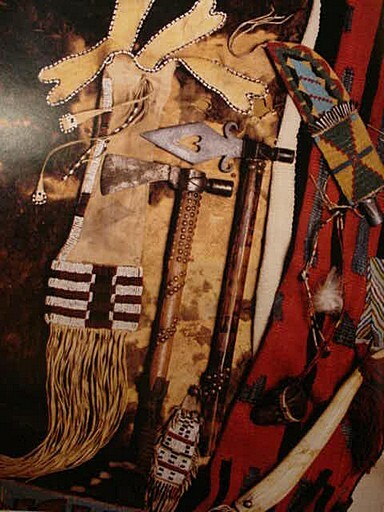 The inclusion of the pipe bowl on the weapon was a brilliant idea on the part of the white traders who learned how much spiritual value that the Red Men attributed to tobacco and their love of weaponry was also taken into consideration as well. 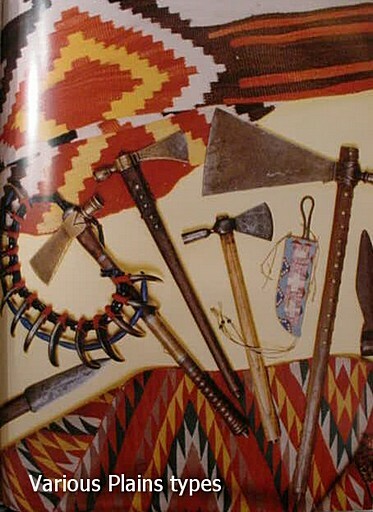 So these axe heads were a great combination piece that would be highly prized by the tribes. 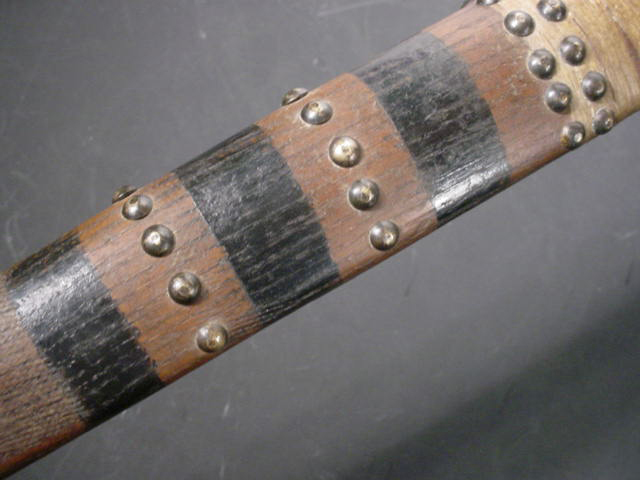 We do not know what culture group this example comes from because the mounting was pretty much the same whether Souix, Crow, Comanche or Cherokee. 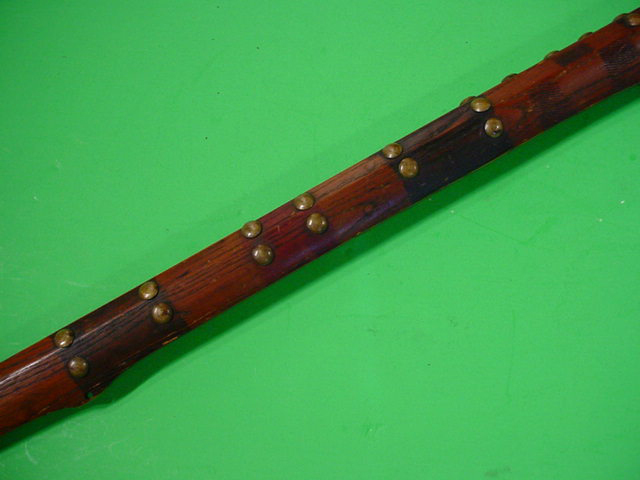 This example is a very fine specimen with the traditional berry staining on parts of the haft. It has many brass tacks applied. 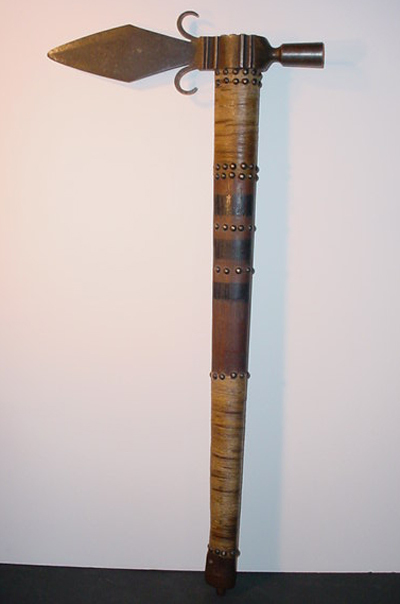 The shaft is drilled though to facilitate smoking, but often as not they were never smoked and for the greatest part never even carried but they would be quickly brought from the tepee or lodge if a photographer was nearby. 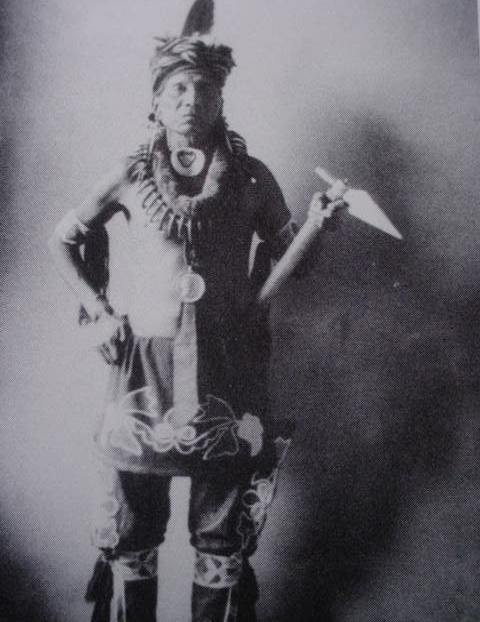 Then it would be an important part of the regalia of the proud warrior as he posed for photo shots by men such as Mathew Brady. 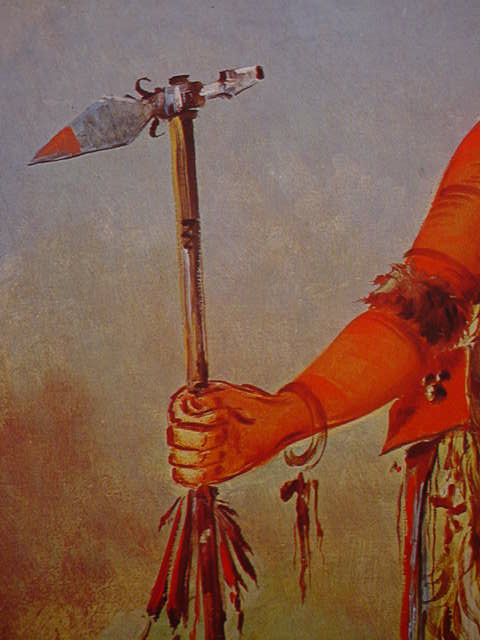 These ‘Hawks’ were of great importance to the proud braves who bore them and extremely rare to find today. 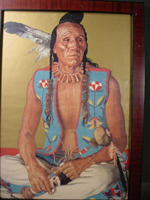 A great museum quality example of historical importance to the preservation of the art and customs of the Native Americans. 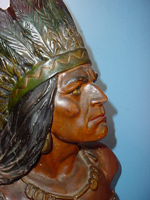 DESCRIPTION: This is an incredible bust by James Gruzalski who is best known for his dramatic sculptures portraying the American Indian and historical figures. His fascination and love for the Old West is exemplified in the faces of his bronzes. He has felt that much can be told about people through their faces. 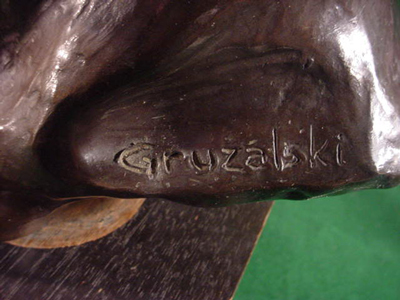 Gruzalski has had a gift which enables him to put life into his bronzes. 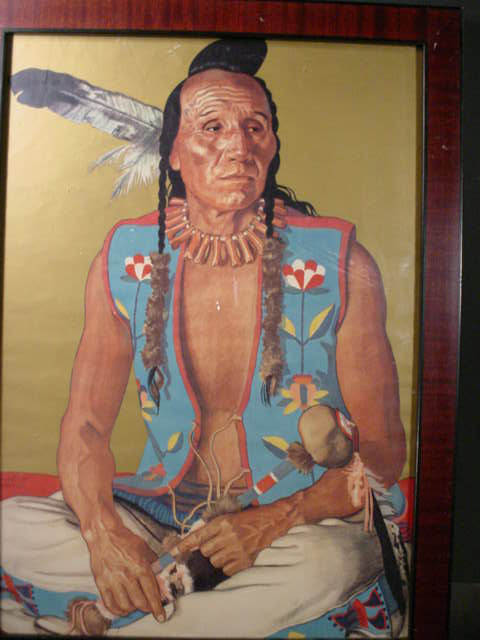 We can see and feel through his work the strength, pride and spirit of the American Indian. 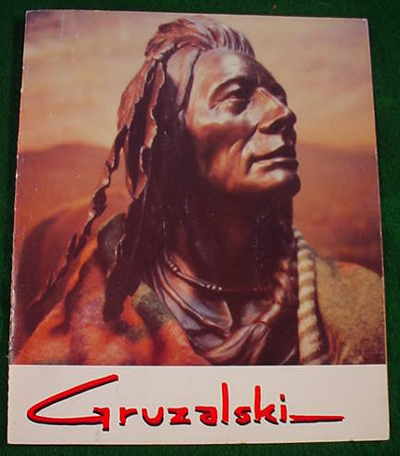 His sensitivity in the execution of his sculpture has been nationally recognized as one of the leading artists of today .Gruzalski has won many prestigious awards at art shows around the country. 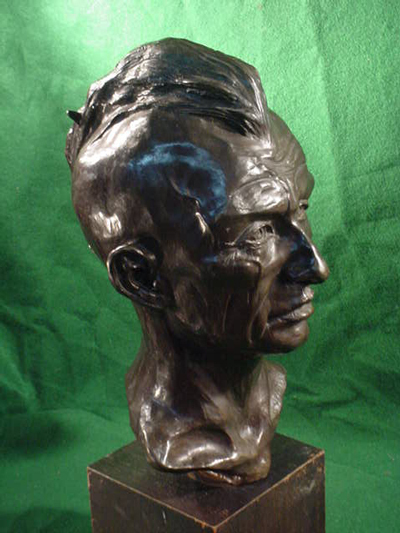 His works are exhibited in some of the finest galleries and are featured in many prodigious private collections. When Jim sculpts a figure he releases a very limited number of them and then it stops! The wonderful sculpture we offer here is number nine of thirty ever made. 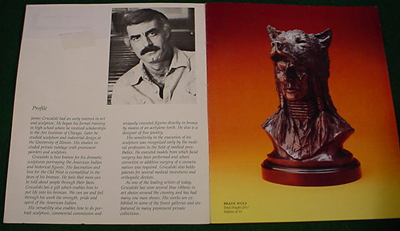 This particular sculpture has been sold out many years ago. There have been only a very few that occasionally show up in the best of auction houses and they invariably bring in the excess of eight to ten thousand dollars. 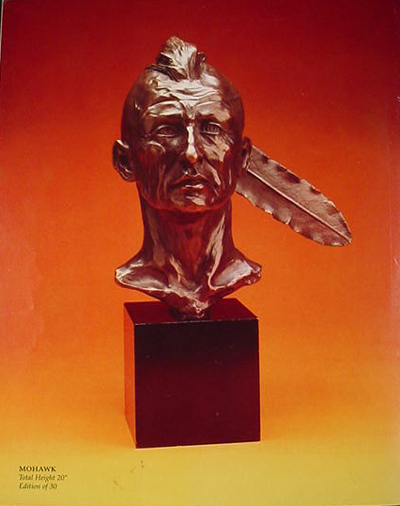 The exciting thing about this bronze is that other artists have sculpted figures in bronze of American Indians but almost 100% of the time the depictions are of western Indians usually with eagle feather war bonnets upon their heads. 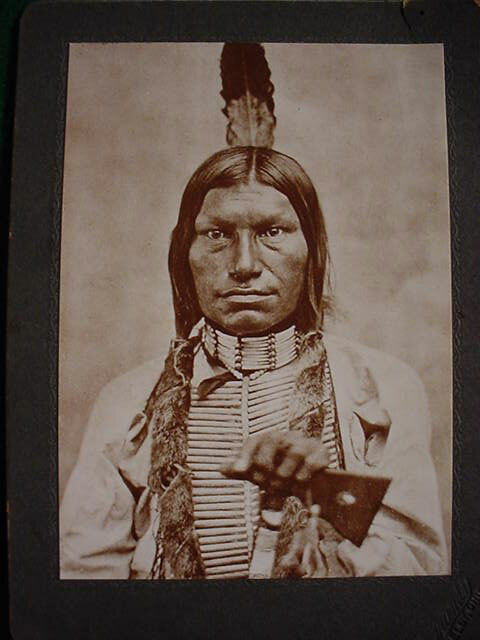 The only deviations noticeable might be Chief Geronimo of the Apache. 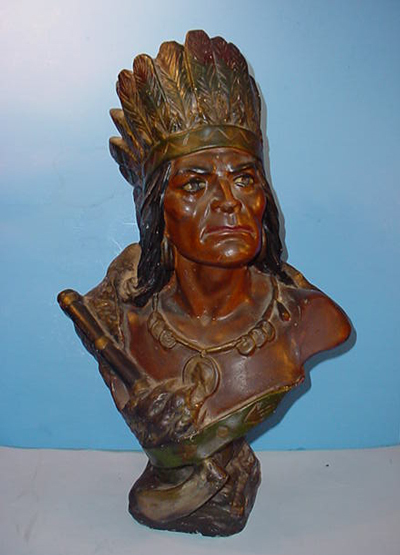 We know of several sculptures of Sitting Bull of the Lakota Sioux but we have never encountered an accurate bronze of an eastern woodlands warrior like this superb bust of a Mohawk. These were the people called the Keepers of the Eastern Door. Dwellers of the Longhouse. 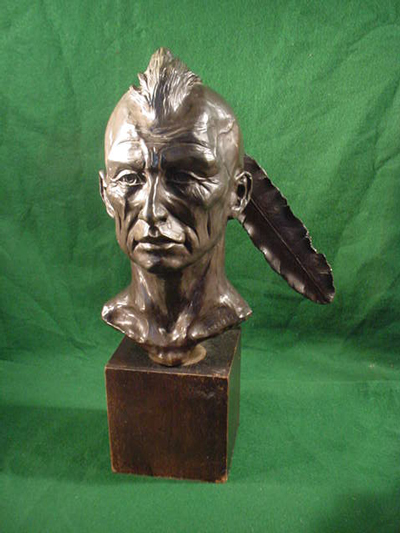 Historically had the Mohawks not joined the British under the influence of the famed Sir William Johnson then the United States (if such an entity ever evolved) would be a French speaking nation. 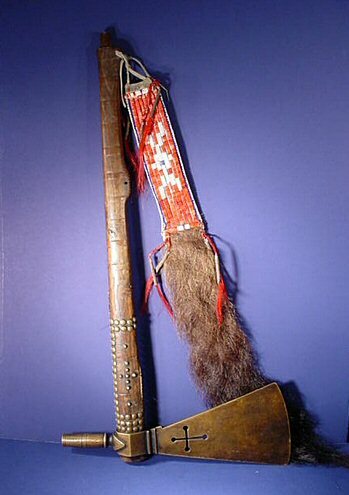 The Mohawks along with some of the other tribes of the Iroquois Six Nations Confederacy carried the torch and tomahawk faithfully against the French in the French and Indian War. 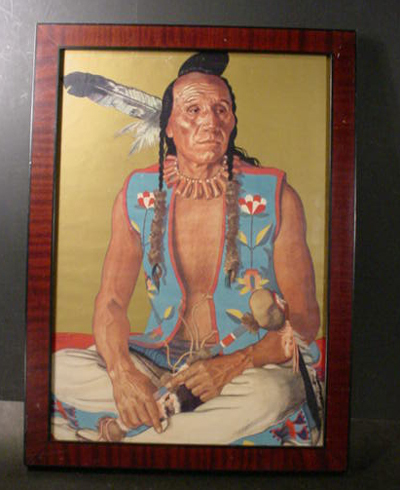 The six Nations of the Iroquois are: Seneca, Cayuga, Onondaga, Oneida, Mohawk, Tuscarora. 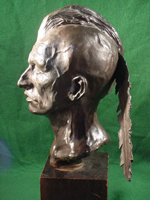 The Mohawks were the most warlike of the nations of the Confederacy. Note the look of pride and confidence in the portrayal of this noble warrior of the eastern forests. 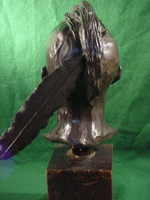 The sculpture is 20 inches high mounted on a wooden base this piece is worthy of a showcase all by itself highlighted with soft lighting. It is a true representative of the spirit of the American Indian. That noble race and brave! From off the crested wave! You shall not wash it out! We make a one-time offer that is most reasonable and when doing that we sincerely hope this extraordinary art piece will go to an appreciative collector or gallery. DESCRIPTION: This was a common thing in the 1870’s- 1890’s and almost every doctor’s office, general store, schools and especially tobacco shops would have one. These were several varieties of them but they all had the feather bonnet. 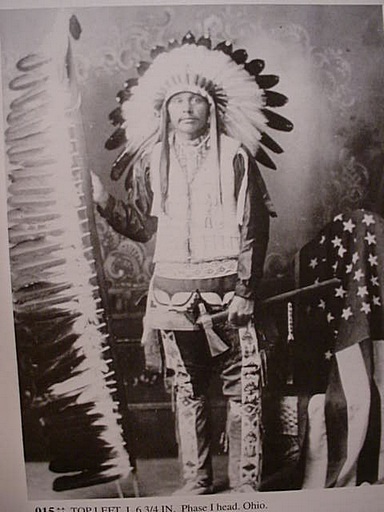 If this was not evident then the average folks wouldn’t even recognize him as a ‘Red Indian.” This one has a war axe (tomahawk) and a bear paw glove. He has a government issued peace medal about the neck and this indicated that he must be a “good Indian”. The bust stands 22 inches high and 13 ½ across the shoulders. It is still covered with dust and has some minor chips here and there (never repainted). 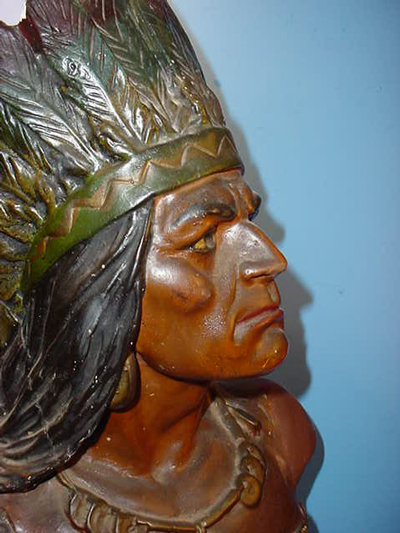 In the 1800’s mediums used to always have one of these in the home to act as a spirit guide to the occult world, being that he Indians were by nature great at tracking and guiding. 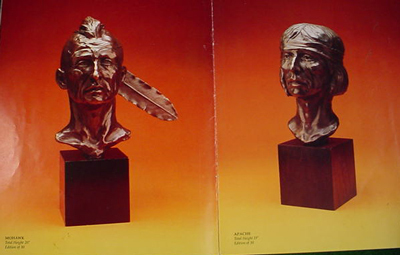 Sometime these busts would have a name (Hiawatha) emblazoned on the plinth. In any case, this is a real piece of American history. 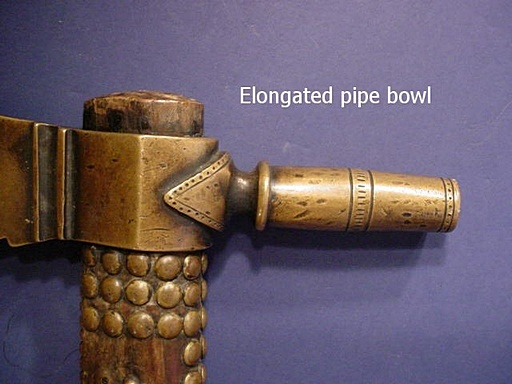 We explained in another article the reason for the inclusion of a pipe bowl in these weapons. It had to do with the spiritual values of the red men. 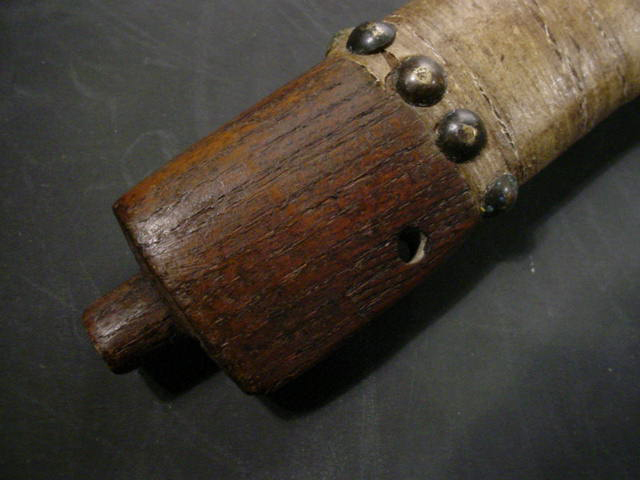 This shaft is done in the traditional manner with berry staining that shows age and of course the shaft is drilled through to allow the pipe to be ceremoniously smoked. 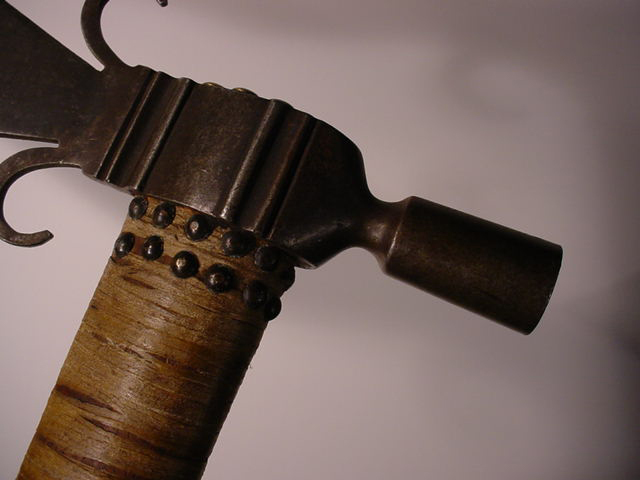 The drilling with limited tools was a painstaking project in those days of yore. “An extremely difficult task”. 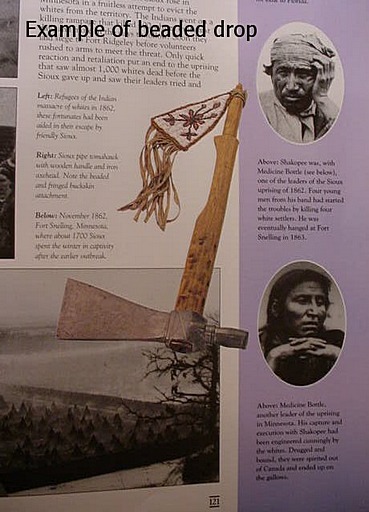 Many examples have been found that were never drilled but this one is in fact drilled through and as we have earlier recounted above in USARTICLES 1-7 these tomahawks were mostly used for show. The hawks similar to the one shown in USARTICLES 1-7 do occasionally show up but a huge spontoon model like this is extremely rare. This is the finest example that we have ever seen in many years of hunting the finest of Indian relics. Look no farther if you are hoping to gain a real museum piece personified. 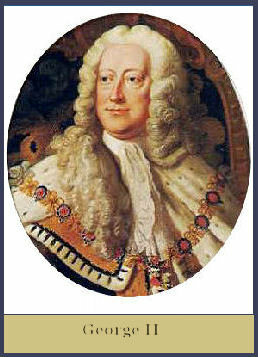 DESCRIPTION: This is an original old print with frame. 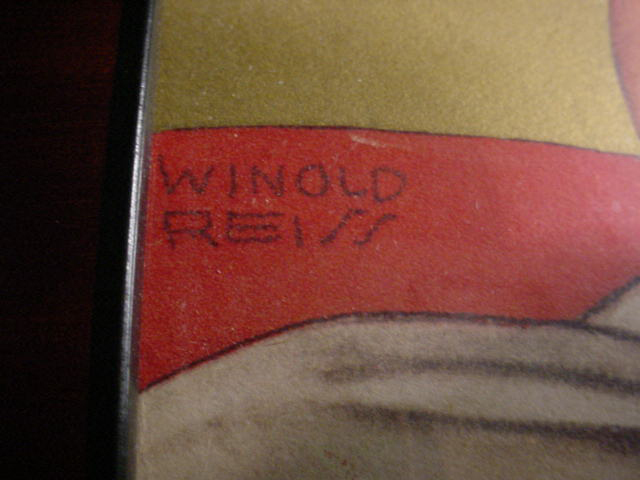 It was from the original painting by German Artists Winold Reiss. It was a part of a series of paintings that he did for the Great Northern Railway Company. 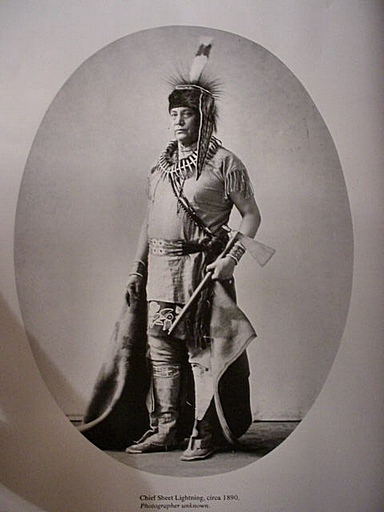 Reiss was filled with romantic idealism about Native Americans and the vast Western scene since he was a boy in Karlsruhl, Germany. There is lots of information on the internet about this great artist. In our opinion his Indian art was the absolute state of the art! 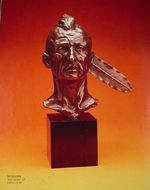 Remington, Catlin, none of the great artists who depicted the American Indian ever came up to the mastery of Winold Reiss. Stark realism attends each painting he ever did. 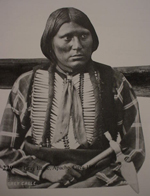 He did not make his first trip to the land of the Blackfoot until September of 1919. But then in his depictions of these proud people he exhibited that he was a uniquely gifted artist with no competition. Adolf Hitler once said in a discussion about Karl May the author. 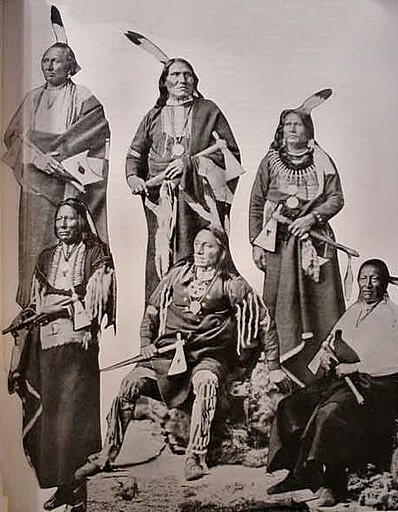 The Americans live alongside of these magnificent people (the Indians) but it took a German to give true literary expression to them. 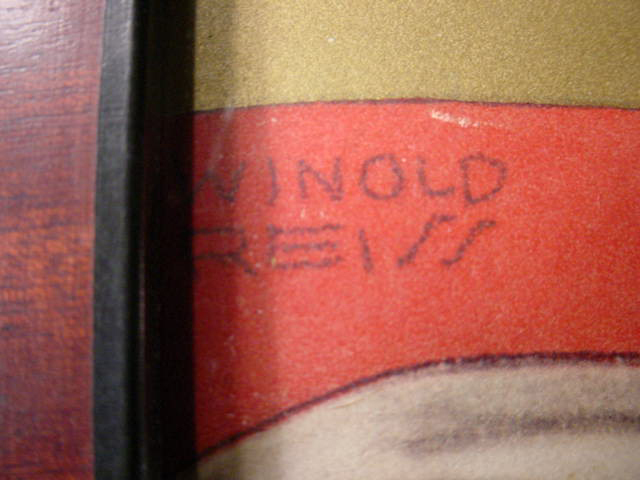 The spirit of the great American frontier resides authentically in the magnificent work of Winold Reiss. Be sure to go to Google and put in the name of this artist and site after site will appear chronically of his art and his life. Young Reiss was like Adolf Hitler, an avid reader of the books of Karl May 1842-1912 whose stories of the American West filled young minds with travel and adventure tales. 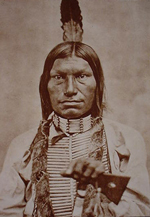 May's books dealt with noble Indians and cowboys and offered moral issues. Today his vast artistic legacy is enjoying renewed recognition and deservedly so. 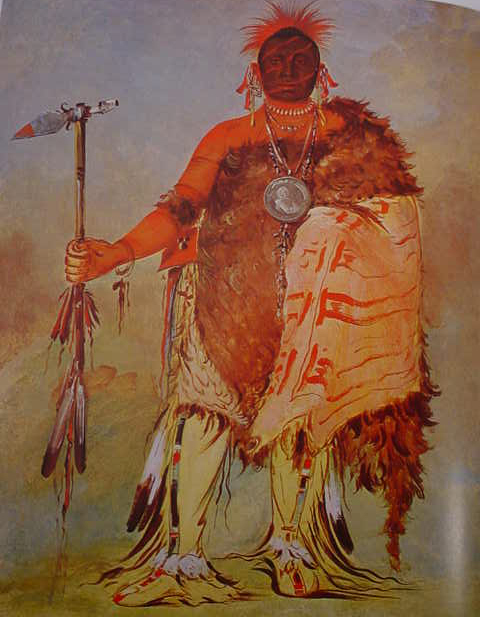 The original period picture we offer is a great depiction of the Blackfoot warrior (Clears Up). We do not know if it was clipped to fit an older frame. (Possibly ) It is now placed in a second frame one no doubt in the last 20 years. The frame and picture measure 19 ½ x 14. A very dramatic picture of Indian nobility at its zenith. May, or may not, be his signature. DESCRIPTION: These cards were sold at various western Wild West shows sometimes by the person pictured and often signed as well by the person pictured on them. 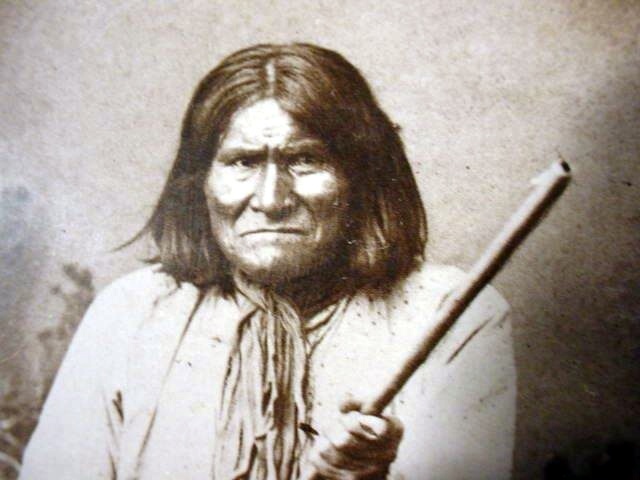 This one is of Geronimo of the famed Mescalero tribe of the Chiricahua Apache Nation; he was a prominent leader of the Bedonkohe band of Apache warriors, who fought against Mexico and the U.S. because of their expansions into tribal lands. 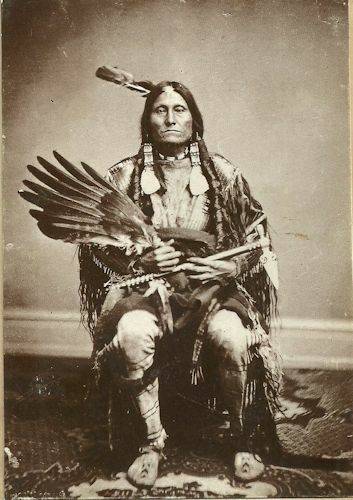 After many years of warfare against Mexicans, whom he especially hated, and fighting against white settlers and the U.S. Cavalry, among hostile Indians he was a hero figure whom they gladly followed and fought for, but in the eyes of the U.S. Government he was a renegade and remained the last of the holdouts. 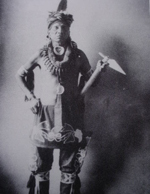 At one point he had 5,000 U.S. soldiers on his heels while he and his warrior band embarrassed military officers by eluding them time and time again while hidden in the myriad mountain passes and caves. 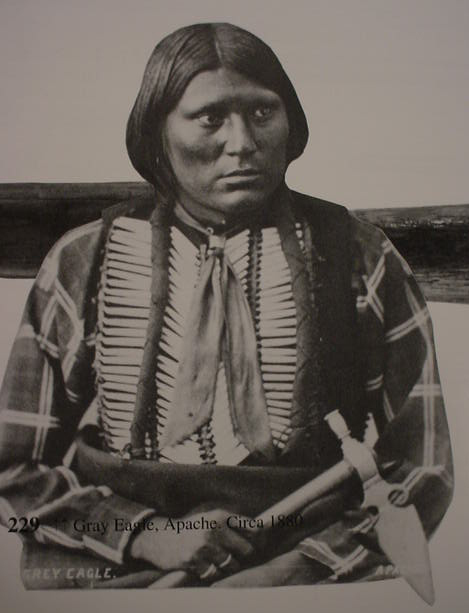 After his eventual surrender, Geronimo became a household name because of his daring exploits. 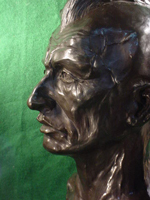 He actually lived to a ripe old age and into the 20th century where he was able to capitalize on his notoriety. He shrewdly used his celebrity to earn fantastic sums of money. 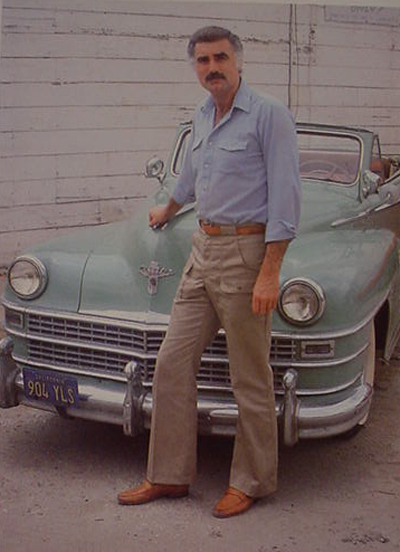 He charged heavily to the promoters for his appearances in Wild West shows, parades, and photo shoots. He charged for his autograph. At the time of his death, Geronimo had $10,000 in the bank. (Imagine what that is in today’s money). 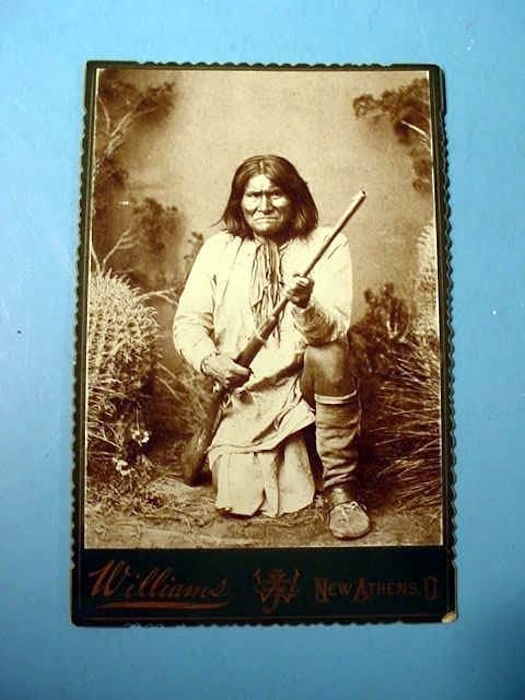 This photo is part of a group of such pieces that we acquired some time ago from a collector at a gun show who had several other such Wild West Show promotional pictures. 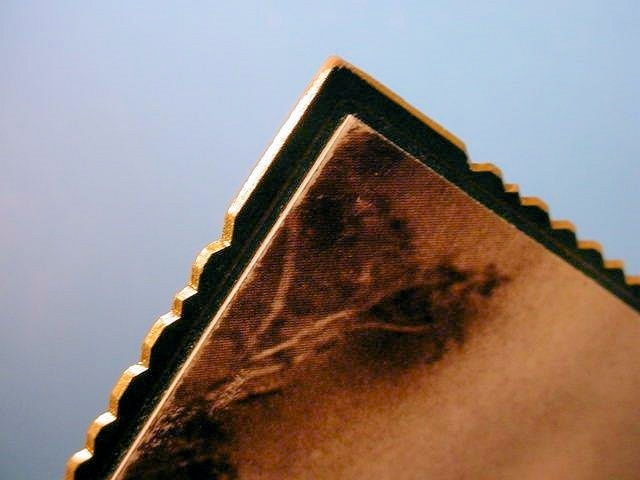 It is a two-piece construction with the photo or photographic print laid on top of a scallop-edged card making it rather heavy. 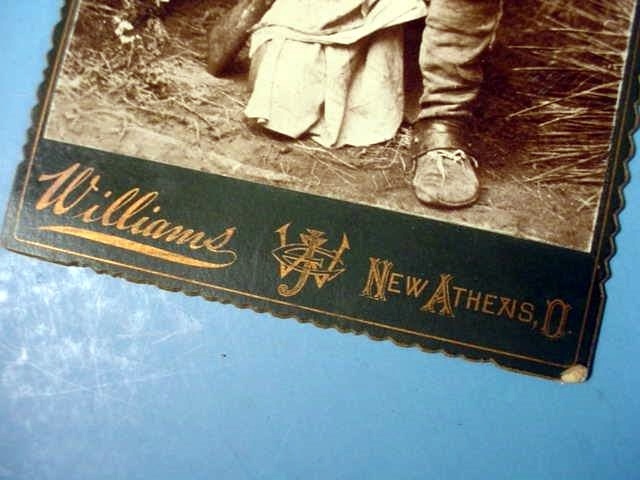 The under card has the company name Williams, in New Athens and that town was and is in the state of Ohio. 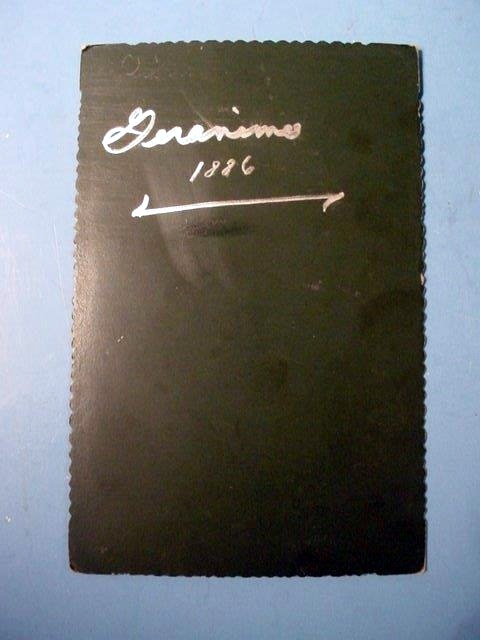 On the back of the card is hand-written “Geronimo 1886.” We do not know if that is the signature of the famed Chiricahua chief or not, so, we will make no such claim. We will sell it as what we have indicated it is—a trading card that appears to be original of the period. Size is 4 x 6 1/2 inches and is in very good condition. 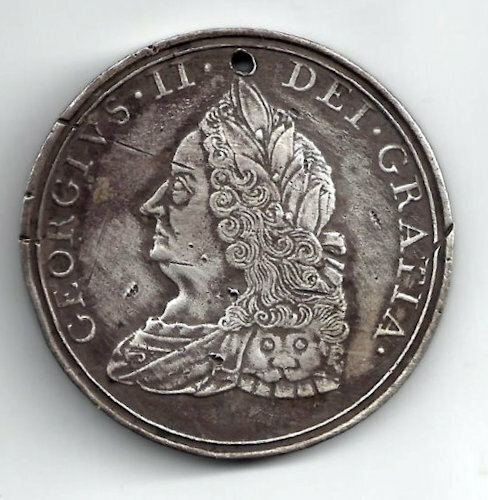 DESCRIPTION: The small, round George II (Georgivs II dei Gratia) Indian peace medal has a Quaker figure on the reverse side offering a peace pipe to an Indian. 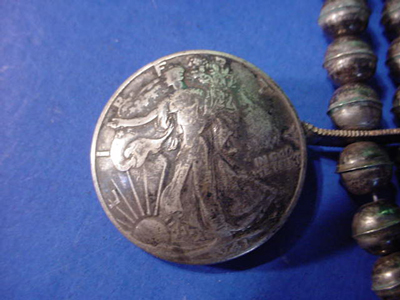 This is a U.S.-mint striking and given by Quakers in silver to nearby Indian chiefs. 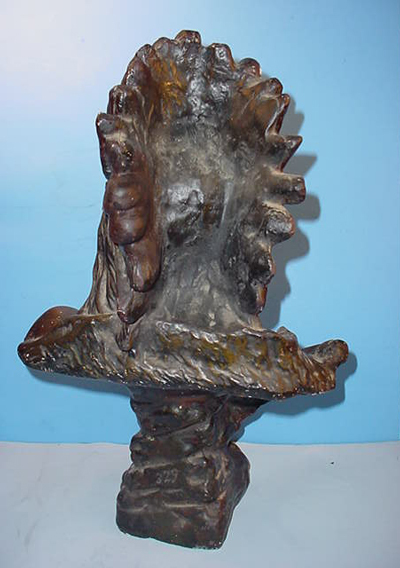 This is in its original state. The front depicts a draped and austere bust of the king’s facing left with the words “GEORGIVS II DEI GRATIA.” On the reverse side depicted are two figures seated at left and right of a campfire. A white man wearing a hat on the right presents a calumet—peace pipe—which the American Indian is reaching for. Above the Indian the sun watches. 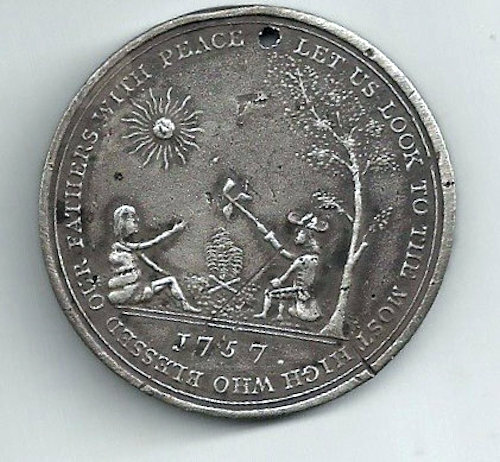 In the back of the white man is a tree and around all this are the words “Let us look to the Most High who blessed our fathers with peace.” Below this scene is the date 1757. The medal is in fairly good condition with a bit of scars, lines, and some edge chipping. There is a scratch going from the edge of the medal to the king’s forehead and another from the front edge. 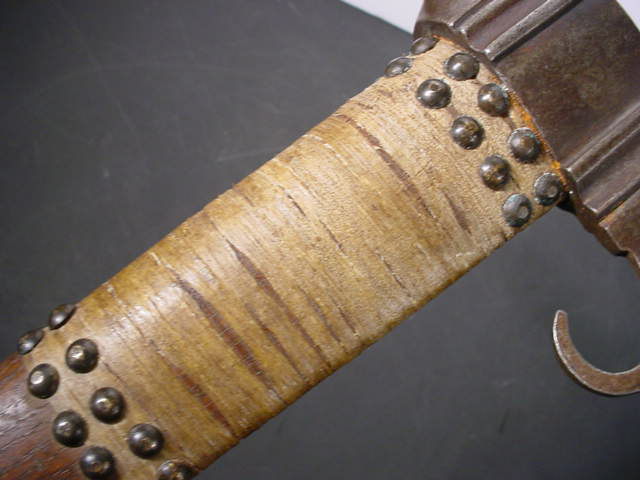 On the reverse there is a scratch going from the 7 o’clock edge to the Quaker’s hat and an edge gouge at 5 o’clock between the words “most” and “high.” The drilled wearing hole at the top looks like it is old, but crudely drilled possibly by the native Indians. 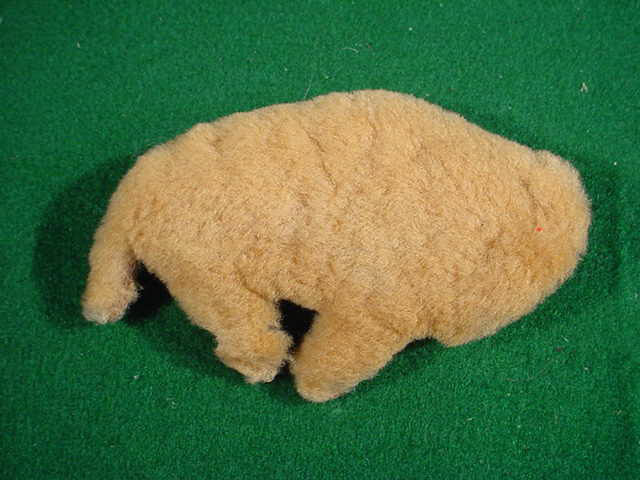 It measures about 2 ¾ inches in diameter. Overall, this rare piece is in pretty good shape in comparison to others we have seen. This item is very seldom encountered. PRICE: Price: We will be taking offers on this historical treasure of Americana.